The FF 91 is a long, low SUV. It has no handles because its doors open as a driver approaches. 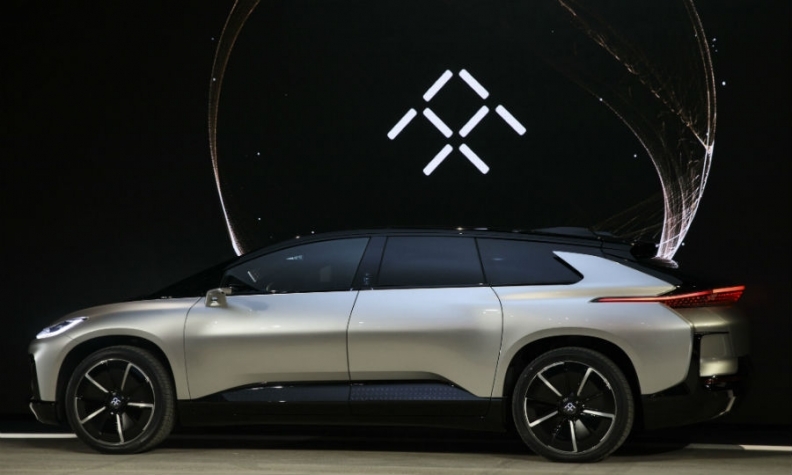 LAS VEGAS -- Electric vehicle start-up Faraday Future showed off a prototype of a vehicle set for production next year as the China-backed company strives to win credibility in the crowded sector and weather its funding challenges. The FF 91, described by its designer Richard Kim as "weird-pretty," is a luxury electric SUV that Faraday executives say will be the most technologically advanced on the market when it goes into production in early 2018. Advance reservations for the car - which insiders say will retail for about $180,000 - are being taken for $5,000. "You're about to witness day one of a new era of mobility," said Nick Sampson, senior vice president of engineering and research and development. "We're going to show the first of a new species." Cash shortages and a recent spate of executive departures have raised questions about the company's prospects. Faraday is funded and controlled by Chinese billionaire Jia Yueting, the CEO of China's Leshi Holdings, also known as LeEco, which is showing its own prototype electric car, the LeSee Pro, at the CES consumer electronics show here. He is also an investor in California-based Lucid Motors, a competing electric vehicle start-up attending CES this year. Faraday debuted at CES last year with a concept car not intended to be produced, raising eyebrows over the company's legitimacy and Jia's overall strategy. A cash crunch at LeEco and Faraday's missed payments to a contractor working on its $1 billion Nevada factory have spurred more questions in recent months over Faraday's financial situation. Faraday executives would not comment on the company's financials. "We're hoping to  convince people that we're real, we are doing a real product, it's not just a vaporware Batmobile to create attention, but we now have a serious product," Sampson told reporters during a tour of Faraday's headquarters in Gardena, California, in December. Faraday Future staked its claim that the FF 91 will be the world's fastest electric car, showing footage of the model outracing Tesla Motors' Model S in a glitzy event here Tuesday. The FF 91 can go from 0 to 60 mph (97 kph) in 2.39 seconds, according to the company. That compares with 2.5 seconds for Tesla's Model S P100D in its fastest 'Ludicrous' mode. Executives say the car's modular architecture and flexible battery layout will allow for a faster roll out of future models. The car will have a range of about 378 miles (608 km) per charge. Its electric motors will generate a combined 1,050 horsepower.